Charles G. West rose to prominence in the late 90s as an esteemed western writer. With an abundance of series creations, like 'Jason Coles', 'Little Wolf', 'Trace McCall' and 'Culver', we are starting to find West alongside other contemporaries like Ralph Compton and William Johnstone populating the retail aisles. While those names are now ghost-written, West remains actively writing full-time and is signed with powerhouse publisher Signet. My first introduction to the author is 2015's “Slater's Way”, one of over 15 stand alone western novels written by West. 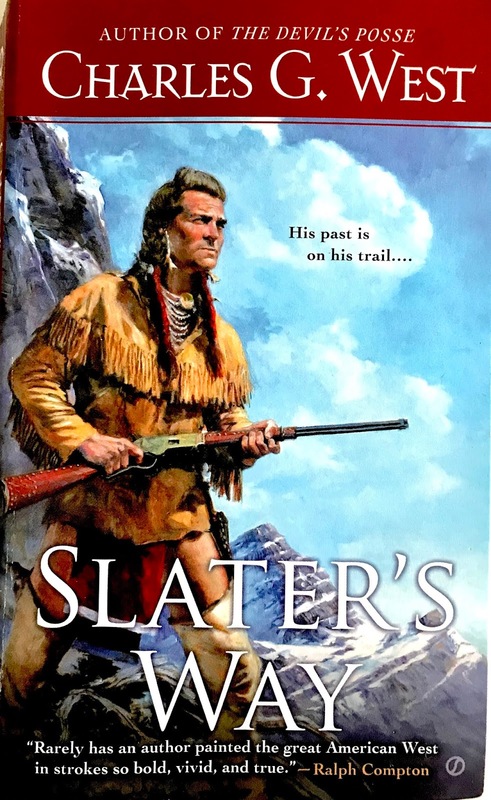 At nearly 300-pages, “Slater's Way” is written as one long epic over the course of many years. As a coming-of-age tale, the reader seemingly grows with the young John Slater Engles. The book's beginning introduces us to Slater and his tumultuous household – Dad is a gambling drunk and Mom is a submissive fool. After a night of partying gone afoul, Slater's father is hung by a pole on the city streets. Slater takes his guns to town, unties his father and attempts to bury him. The town's vigilante committee takes offense, shots are fired and Slater leaves home for the Montana mountains. Soon, Slater pairs with Teddy Lightfoot, a white man who is living peacefully among the Crow. Both Teddy and his wife Red Basket welcome Slater to the tribe and together he learns the way of the Crow and the paths through the dense Absarokas mountains. It's this short section of the novel that grooms Slater as a mountain man, sort of a “Jeremiah Johnson” meets “Smoke Jensen” story. Fast forward a few years and the next phase of Slater's life begins. Slater and Teddy find that the Crow tribe are targeted by the Sioux, a pocket of braves who are at war with the closest Calvary outpost. After a mountainside battle, Teddy is killed and Slater defensively kills a number of Sioux. Word of the battle reaches Iron Pony, who discovers that his brother was killed in combat with Slater. There's a score to be settled and about 150-more pages left. While it would be fairly simple for West to circle the revenge narrative of Iron Pony, West really enhances the mood and story by indulging in an epic prose. Mixed into the plot are a number of side stories featuring Slater as Calvary scout, his friendship and duties with Lieutenant Russell, repressed mourning and his relationship with the motherly Red Basket. Like any good western, the past will eventually catch up to our hero. Mixing this central storyline with Iron Pony's determination makes for a whirlwind of action and adventure. As a bulky western read, I can only imagine this as a series concept featuring various Slater adventures. Maybe at some point it will be, but considering three years have passed and there hasn't been a sequel...I'd speculate this is all that West intended to say about the character. Overall, this was a very satisfying read and an impressive sampling of West's work.